I haven’t written anything here in the past two weeks as my spare time has been taken up with preparations for our Passionist Institute which begins this evening at the Emmaus Retreat Centre, near Swords, Dublin. We have just over forty participants, laypeople and Passionists, from various parts of our Province. I will be giving talks tomorrow (Wednesday) and Thursday on Saint Paul of the Cross, with powerpoint slides (‘Saint Paul of the Cross and Technology’), and on Friday Father James Sweeney C.P. will be addressing some more recent questions. Father Frank Keevins C.P. will act as moderator and lead us through these days. In its online catalogue, the National Library of Scotland gives a short excerpt from a video of the first Lourdes Day Rally of the Diocese of Galloway held at Fatima House, Coodham in 1958. Coodham was a Passionist Retreat House from about 1946 until 1988. After the Passionists sold the property, it was allowed to fall into ruin, with the interior being completely destroyed by fire some years ago. The house has now been restored and converted into nine high quality apartments. Today in the Passionist Calendar we celebrate the Feast of Our Lady, Mother of Holy Hope. 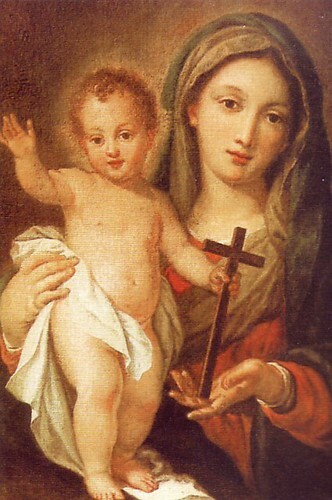 The origin of the devotion among the Passionists is an image of Mary holding the child Jesus who has a cross in his hand, recalling the teaching of Saint Paul of the Cross that ‘the whole life of Jesus was a cross’ and the life of a disciple of Jesus means remaining on the cross with him. The original picture, described as a copper engraving (and, I suspect [i.e. this is my own personal theory, so you don’t have to believe it] the work of the neapolitan artist Sebastiano Conca), belonged to Father Lorenzo Ricci, the General of the Jesuits. When the Society of Jesus was suppressed in 1773, the image came into the possession of Saint Paul of the Cross. Paul’s successor, Father John Baptist Gorresio, had copies made and it became the custom for each religious to have one of these prints (or perhaps engravings) in his cell. Father Gary has a long quotation on Mary, Mother of Hope from Pope Benedict’s Encyclical Spe Salvi. He also has pointed out a reflection on the Mother of Holy Hope by Father Sebastian MacDonald C.P., and the Young Priest gives us a Prayer to Our Lady of Holy Hope. Given the recent news of Cardinal Newman’s impending beatification, it is interesting to note that when Newman was returning to England from Rome in 1847, the Passionist General, Father Anthony Testa, gave him some prints of the picture of Our Lady of Holy Hope to bring to Blessed Dominic Barberi C.P. This was the first time the picture had been brought to the English-speaking world. 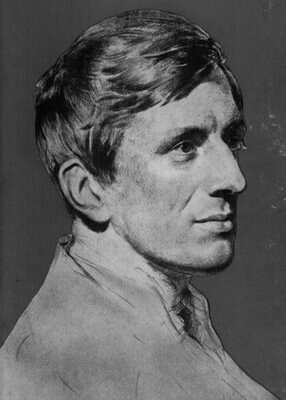 Thank you, soon-to-be-blessed John Henry Newman, for bringing us the Mother of Holy Hope! Going through some papers today, I came across a note I had taken a few months ago when I spent a day reading at the archives of the Scots College in Rome. In a letter presenting a new student to the Rector of the College in 1877, a diocesan official wrote: He has unquestionably a very ecclesiastical turn of mind and like so many converts he has a strong passion for ceremonies, altars, vestments, etc. 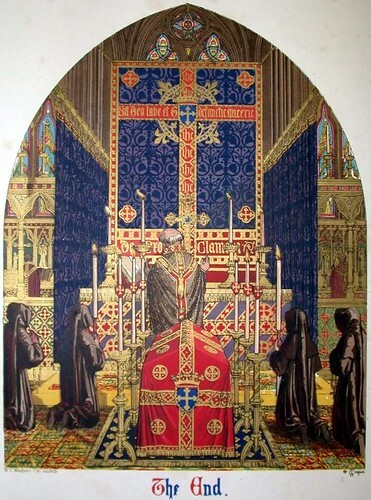 The picture shows the final page (The End) of Pugin’s Ecclesiastical Ornament. An exercise we were often given in school was to compare and contrast two pieces of writing. Why not try this yourself with these two accounts of the forthcoming visit of the relics of Saint Thérèse of Lisieux to Her Majesty’s Prison, Wormwood Scrubs. For inmates at London’s Wormwood Scrubs prison praying for redemption, help may soon be at hand from “the greatest saint of modern times”, writes Caroline Davies in The Guardian (of all places), while John Walsh comments in The Independent: To find, in 2009, that a casket of relics from a long-dead saint can warrant its own multi-venue rock tour of western Europe, with an entourage of stage managers and roadies, thousands of adoring zealots and (okay, I’m guessing) special tour merchandise (“£15 for the Little Flower T-shirt: roll up!”) is more than laughable; it’s positively alarming. 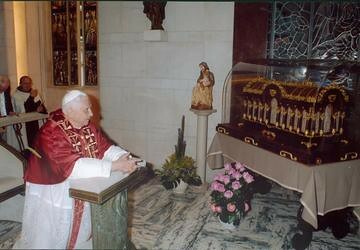 You can find more information on the Visit of the Relics of Saint Thérèse to England and Wales here. The Canonisation of Saint Maria Goretti was the first canonisation to be held in Saint Peter’s Square, attended by more than half a million people. 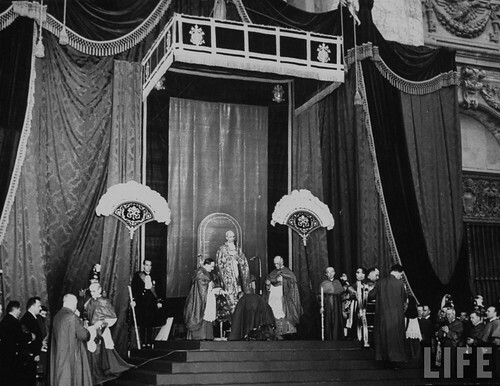 The photograph shows Pope Pius XII celebrating Maria’s canonisation. Assunta Goretti, who watched the ceremony from above the Piazza, was the first mother to be present at her daughter’s canonisation. GloriaTV has a very interesting documentary on the life of Saint Maria Goretti, whose feast is today. It is in two parts. Among Passionists who are featured are Father Godfrey Poage, whose vivid imagination made Saint Gabriel the unofficial patron saint of handguns, and Father Fiorenzo Bordo who is now Provincial Superior of the Presentation Province. Click here for part one and here for part two. Part two has some rare film footage of the canonisation ceremony and the voice of Pope Pius XII proclaiming Maria’s sanctity, as well as Father Godfrey’s own recollections of what happened that day. Alessandro Serenelli, who killed Maria, is one of the great marvels of the mercy of God. After years in prison filled with hatred, he was converted to Christ through Maria’s intercession and, after his release, went to Maria’s mother to ask her forgiveness. He spent the remaining years of his life in a Capuchin monastery and died a saintly death at the age of eighty-eight. Congratulations to Father John Auram C.P. who was ordained to the Diaconate today at Saint Paul the Apostle Parish, Endeavour Hills, Melbourne. 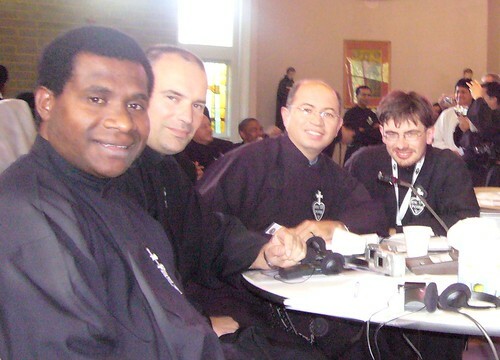 Father John, who is from Papua New Guinea, is a member of the Province of the Holy Spirit.